The event took place on a hot afternoon at Constitution Hall in Washington, DC. As Peaches played her theme song “Boys Wanna Be Her” live, Sam Bee walked out on stage, her hair down and a white pantsuit over a black tee, and the crowd gave her a spontaneous standing ovation. Bee was visibly moved by the reaction from the crowd, telling them that she has never played to a crowd this large. It was one of those strange moments when you realize that, even though millions of people watch her on television every week, she’s never played to an audience this large. The crowd roared throughout the dinner, with laughs drowning out many of the jokes that followed, but here are some of the best jokes that I heard. Alongside Bee’s monologues the show aired various filmed pieces. Some of these segments were from previous (fictional) White House Correspondents’ Dinners where Bee played people who were famous at the time of the dinner. For the dinner for Ronald Reagan, she dressed up like Madonna, and performed a series of jokes that would’ve been topical in the mid ‘80s. Bee did a piece on Rupert Murdoch and Fox News, which has made all news question itself and made them paranoid, asking if the suits they wear make them look too liberal. All throughout the show, Bee promised a special guest, and as part of that, she mocked how the cable news stations will show an empty podium where they’re expecting Trump to appear, and will keep showing that empty podium and talking about that empty podium while minimizing the “real news” in a tiny screen in the corner. So, for a couple of minutes, the show was projected with Sam in a tiny corner and the empty podium. When the special guest came out, it was Will Ferrell as George W. Bush. The first thing he said was “How do you like me now? I’m the prodigal son.” Only it’s clear that he doesn’t know what prodigal means. 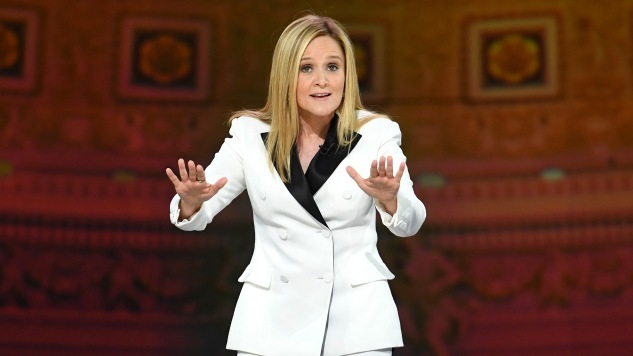 The last filmed correspondents’ dinner segment saw Samantha Bee hosting a White House Correspondents’ Dinner after Mike Pence becomes president. She came out as “Mrs. Jason Jones,” tripped over her words, and is generally very timid and struggles to talk normally. Lorraine Berry writes about cultural issues at LitHub, The Guardian, Signature and other outlets. Follow her on Twitter @BerryFLW.